I’ve never been much of a bath person… which is probably because I’ve never lived in place that has a standalone bathtub. Just looking at this bathroom could make me change my mind though. It reminds me a bit of Kate Winslet’s English countryside cottage in The Holiday, don’t you think? 4 Responses to "Cottage bath." I think I would always be taking a bath if this was my bathroom. I especially love that nook of a fireplace…Perfect spot for lighting candles while your soaking! I love an occasional lavender oil bath, so soothing! 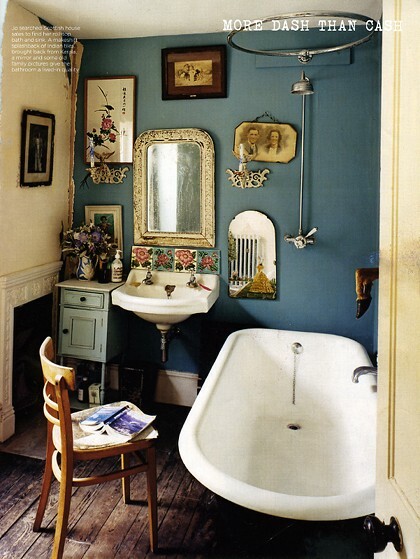 love this romantic/vintage vibe – i long to have a tub with little claw feet one day!